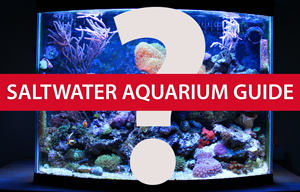 What is the main purpose of having lights in your aquarium? So you can see the fish? It’s not as simple as that. The main idea behind aquarium lighting is to replicate the natural environment of your aquarium inhabitants – you want to make sure the lighting conditions are similar to what they would experience in the wild. The lights in your aquarium will supply photosynthetic energy to the fish, invertebrates and plants that are in your aquarium. The lights in your aquarium can also have an effect on the behavior of your fish and other inhabitants. It is best to maintain a day/night cycle with your aquarium lights. This can be achieved simply by turning the lights on during the day and turning them off at night. Timers and other electronics can be implemented to automate this cycle as well, it’s pretty easy to automate aquarium lights. These are referred to as standard because they are pretty much a standard. If that makes sense. Because of the popularity of fish-only aquariums, these types of aquarium lights are very popular. They are available in many colors and intensities. It is easy to find this type of light at any store that sells aquarium supplies. T5 HO fluorescent lights are compact and offer great luminosity in a tighter design than standard fluorescent lights. The types of lights are very popular at the moment, due to being cost effective, compact and bright. If you need to fit more light intensity into a smaller space, these can be a great upgrade from standard fluorescent lights. Compact fluorescent lights can be found in many of the same lighting colors and intensities as standards. But they take up less space and emit more light. Metal halides provide more intense light than the two fluorescent options. These lights use high intensity discharge systems to operate. High intensity discharge is also referred to simply as HID. When would be a good situation to implement metal halide lights? Some reef aquariums require intense lighting conditions, higher than fish only aquariums. These types of reef aquariums would be suitable for metal halide lights. They can also be good for very deep aquariums, where it might be harder for traditional fluorescent lights to reach the deeper parts of the tank.